The International Conference on Cultural Policy Research(ICCPR) is a biennial international symposium on cultural policy whose objective is twofold: firstly, to promote an exchange between the scholars of cultural policy research from different parts of the world, and, secondly, to bring simultaneous development of cultural policy throughout the network. 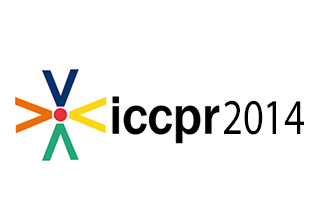 Since the first ICCPR was held in Bergen, Norway, in 1999, in which around 140 scholars from 17 countries participated, the ICCPR developed into a regular international conference that took place every two years in various cities worldwide. The list of cities where the conference has been held so far is as follows: Wellington, New Zealand (2002); Montreal, Canada (2004); Vienna, Austria (2005); Istanbul, Turkey (2008), Jyväskylä, Finland (2010); and Barcelona, Spain (2012). 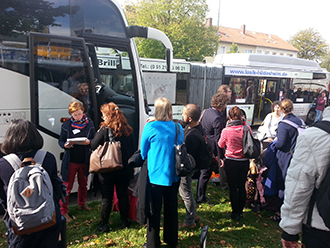 This year, the 8th ICCPR was held in Hildesheim and Berlin, Germany. Since the fourth conference in Vienna, in particular, the ICCPR began to demonstrate a dramatic growth: the 2005 symposium drew over 400 scholars from 52 countries to participate in the conference, demonstrating the increasing interest in cultural policy on a global level. 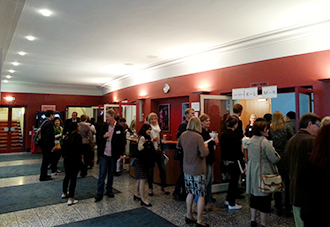 ICCPR has successfully maintained the event’s size and popularity in this year’s conference as well. For the ICCPR 2014, the estimated number of applicants who submitted proposals for the February deadline was more than 400 researchers from 73 countries. In the end, the conference organizational committee selected about 310 participants from roughly 60 countries among those applicants. Another strength of the ICCPR, along with its growing scale, is the quarterly journal,The International Journal of Cultural Research, which publishes a collection of studies carried out in association with the conference. Every paper presented at the ICCPR automatically becomes eligible for publication in the journal, which enjoys considerable stature in the field of cultural policy. For this reason, members of the conference organizational committee can be seen attending panel presentations in search of papers to be published in the journal. 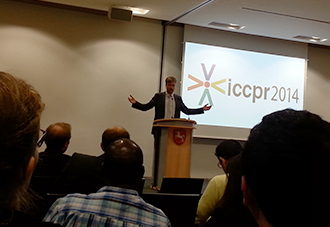 Since the ICCPR itself has earned its own reputation as a relevant symposium in the field of cultural policy, the papers presented at the conference often receive publication requests from other academic journals as well. The ICCPR 2014’s host institution, the University of Hildesheim, is located in Hildesheim, a city in the Hanover region that houses two UNESCO World Heritage Sites. The university’s Department of Cultural Policy was founded in 1998 as a part of the arts and cultural studies discipline. With the approval of the UNESCO headquarters in Paris, the institution established the UNESCO Chair in Cultural Policy for the Arts in Development, and Prof. Wolfgang Schneider was announced as the first chair holder. As a result, the University of Hildesheim can count itself among the 10 German universities that were approved to offer the UNESCO Chairs. Hildesheim is not only famous for its university but the city is also renowned for its cultural richness, with buildings and artifacts that have been added to the UNESCO list of World Heritage Sites. 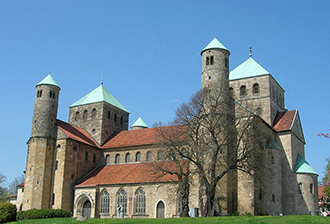 Along with St. Michael’s Church (constructed between 1010 and 1022), built in the Romanesque style, and the Diocese of Hildesheim, which will celebrate its 1,200th anniversary in 2015, the majority of the enduring medieval buildings standing at the city center can be dated back a thousand years. One place of particular interest to me was the so-called Kulturcampus (Culture Campus) Domäne Marienburg, the home of cultural studies at the University of Hildesheim and the space in which the ICCPR 2014 took place. Domäne Marienburg, which is not only removed from the city center but also from the main campus, is accessible by shuttle bus. 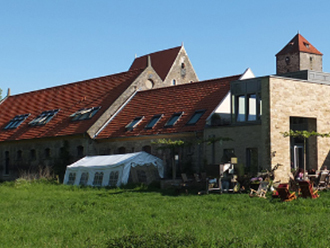 The original building was renovated from the outbuildings or cattle sheds of the farms located at the outskirts of the city, and its exterior has been maintained as an example of 15th century medieval architecture of Germany. This spatial divide between the conference venues and the city center created a distinct atmosphere and scenery that contrasted with that of ICCPR 2012, which was held at the University of Barcelona in the heart of its namesake city. Given that the focus of the conference is culture, the ICCPR is famously known for taking the unique local flavor of the area into consideration when choosing its host city. This stems from the expectation that the university or academic institution that holds the ICCPR will provide participants with an itinerary of unique cultural experiences from around the region, as well as intellectually stimulating presentations and discussions. In the case of Barcelona, as the city itself provided such diverse opportunities for cultural enjoyment, the cultural events prepared by the host university did not stand out distinctly. The participants were free to go about the city by themselves, exploring the aspects of Barcelona’s fascinating culture that appealed to their individual tastes. However, this also had the adverse effect of leaving some of the presentation sessions, which are intended to be the main attraction of the conference, practically empty because too many participants were touring the city instead of attending the lectures. By hosting the conference in a relatively isolated place, Hildesheim was faced with the complete opposite situation: While the participants were better situated to focus on presentations and discussions, the university was forced to prepare events that could relay to the participants the beauty and appeal of the city and the university despite the school’s distance from the city center. The decision to add additional events in Berlin (Sept. 12–13) directly after the conference had concluded may have been an effort to compensate for Hildesheim’s limitations as a smaller city. However, even if we were to exclude the part of the program that took place in Berlin, the ICCPR 2014 set itself apart from previous years’ programs starting with the opening ceremony. 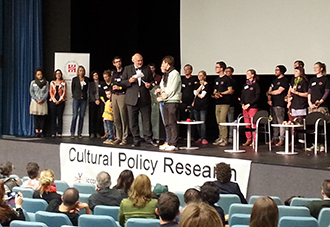 In lieu of giving the same style of opening address as was delivered in previous years, the introduction to the conference comprised diverse performances given by both students and professors of the university’s cultural policy studies department, held in Hildesheim’s city theater on the evening of Sept. 9. The performers wore white gloves entered from the audience entrances, walked around the audience’s seats freely while shaking hands with the participants until they finally got on stage. The showcase included jazz music, a pantomime performance with other local artists, and clips of films some of the performers had made themselves. Overall, the multimedia opening ceremony was filled with an artistic yet whimsical sensibility that served as an excellent icebreaker for the conference, successfully melting away the nervous atmosphere and participants’ travel fatigue. The result was an environment that allowed the attendees to open up and converse with the other participants at the reception while feeling much more relaxed and animated than they were before the opening ceremony. Although ICCPR 2014 was a gathering that dealt with the nuances of cultural policy, the presenters did not attempt to define the term “culture” in a singular, straightforward manner, a decision that can likely be attributed to the complex meanings connoted by the term. Instead, the organizing committee prepared a separate session reserved for an intense discussion on particular theoretical themes related to culture, separate from the sessions on general cultural policy. Whereas the organizers of ICCPR2012 in Barcelona selected “culture and politics” as the event’s major theme, opting to host discussions regarding the use of diverse cultural policies as political tools, ICCPR 2014 in Hildesheim focused on the role and policy effects of culture within international exchanges and the global environment. Another characteristic that differentiated ICCPR Hildesheim from ICCPR Barcelona is that, in addition to the European and American participants, there was a dramatic increase in the number of participants from Middle Eastern, African and Asian nations. 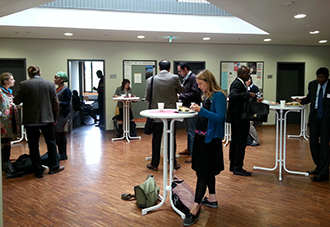 The increase of Middle Eastern and African scholars’ participation speaks to the networks that the University of Hildesheim has worked hard on to establish, a product of the university’s collaborative research with Arabic cultural policy groups and leadership on various Africa-related projects. As for Korean participants, there were only two presenters at ICCPR2012, both Ph.D. students studying in England and Barcelona, respectively. This year, however, saw participation from not only scholars and students conducting Europe-based research but professors from Korea—a group including Prof. Kim Sehun and Prof. Kim Sae June from Sookmyung Women’s University and Prof. Seo U-seok from the University of Seoul—presented their research on cultural welfare policy on the peninsula. 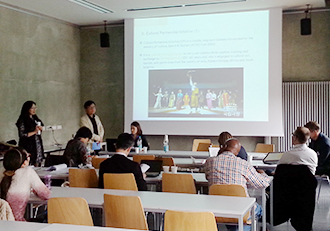 Moreover, Lee Ji Young and Chung Insun, two Korean students in doctoral courses at Tokyo University, presented papers on drama regulation policy during the Japanese colonial period and the Korean film policy, respectively. In addition to enabling an academic comparison of different notions of culture, the multiethnic aspects of the conference also brought out active discussions on the discourse of cultural policy on various dimensions, such as people’s rights to relish culture, the level of diversity seen in cultural enjoyment, and the ethical discourses within each culture and conflicts stemming from them, all of which are common problems in the Middle East and East Asia. On a personal level, it helped the participants establish an extensive cultural network that stretches out to all over the world. The increased diversity of participants was also read as the beginning of a break from Eurocentrism, something that the ICCPR has deemed problematic in the past. Due to the term “culture” being such a wide-reaching term, ICCPR 2014 covered a multitude of themes from a diverse array of fields. In addition to discussions surrounding the subject of arts policies in each nation, the unseen political context behind the cultural policies of global organizations such as the U.N. and E.U. and the cultural industries of numerous for-profit organizations, the cultural policies of non-government organizations were also examined at length. The talks included analyses of important political subtext that gets interlaced with cultural policy; cultural policies carried out not only by the governments but also by individual institutions such as museums, theaters, and concert halls, and other aspects of cultural industries propelled by the profit organizations; and the policies implemented by non-government organizations. 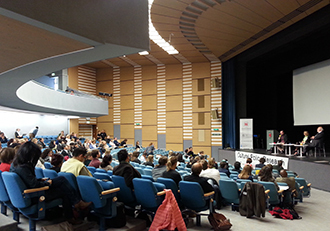 According to the organizers, there was a noticeable increase in the number of presentations on urban regeneration policy, including the urban design, whereas a relative decrease was seen in the number of discussions pertaining to media and cultural industries, as compared with the presentations given at ICCPR 2012, Barcelona. Participants from nations in the Middle East and Africa offered ardent criticism on the regulatory elements of their respective national cultural policies, which often became the cause of splits and conflicts between tribes or ethnic groups. The notion of implicit cultural policy first introduced in Barcelona has developed significantly over the past two years, resulting in individual sessions dealing with diverse themes such as religion, narratives, or symbols that are connected to the concept. The session on narratives and cultural policy that first appeared this year attracted so many interested participants that some had to stand in the back to listen. Claudia Chibici-Revneanu(UNAM, ENES León, Mexico) presented a comparative analysis of the narratives of “prodigy” surrounding the Romantic musicians of 19th century Germany and the native Mexican musical groups of the modern age and discussed how such narratives influenced the cultural policies. Jeremy Ahearne (professor at the University of Warwick, U.K.) examined the fragments of cultural policy visible in fiction works by two French writers. Constance DeVereaux (Colorado State University, U.S.A.) analyzed the narratives of heroism and civil religion hidden in the American arts policy. Such varied themes and an explosion of interest is a step forward from the past research trends, in which “cultural policy” was only explored in relation to public policy, welfare policy, or arts policy. The diversified topics and participant backgrounds provided an environment in which the researchers could discuss the implicit political purpose inherent in the cultural polices of each nation and discipline. Prof. Wolfgang Schneider, who was the host of this year’s conference, underscored the importance of first and foremost considering the political context in cultural policy research. He stressed that taking such a stance would not only be of help to intellectual progress but also aid future social reform toward equality. In reality, the conference affirmed that while most cultural policies are established by each individual country, the overarching cultural discourse is still strongly dominated by Eurocentrism. In the closing ceremony, there was a discussion regarding the best way to bring justice and unity through academic research. Among the excellent ideas brought forward, it was suggested that, beyond being conducted to merely further an individual academic’s career, cultural policy research can be used to pursue essential values, something akin to a social movement that promotes discussions and consensus. While the participants were actively involved in presentations and discussions, in one corner of Hildesheim a competition went on among Seoul (Korea), Liverpool (U.K.) and Antwerp (Belgium) to decide which city would host the next ICCPR. A week after the closing of the 8th ICCPR, the Hildesheim ICCPR organizing committee sent out the most recent newsletter to participants and members indicating that the 9th ICCPR would take place in Seoul, Korea, and be hosted by Sookmyung Women’s University and KAMS. This would mark the first time an Asian nation would host the event since the ICCPR started in 1999, which will hopefully unfold more diverse discourse on cultural policies that are different from those of Western countries. Noh Seung-rim is a music columnist who is currently completing a Ph.D. program in Cultural Policy Studies at Warwick University. She worked as a music journalist for the Monthly Music Performing Arts Magazine [Auditorium] from 1997 through 2004 and worked at Seongnam Cultural Foundation before serving as executive secretary for the Daewon Cultural Foundation. She has written numerous articles pertaining to performance and music for various media and performing arts magazines. She has also translated such works as Art Lover: 『A Biography of Peggy Guggenheim』(Anton Gill, 2003), 『Music and Power』(Veronika Beci, 2001), and 『Parallels and Paradoxes』(Edward Wadie Said and Daniel Barenboim, 2003).